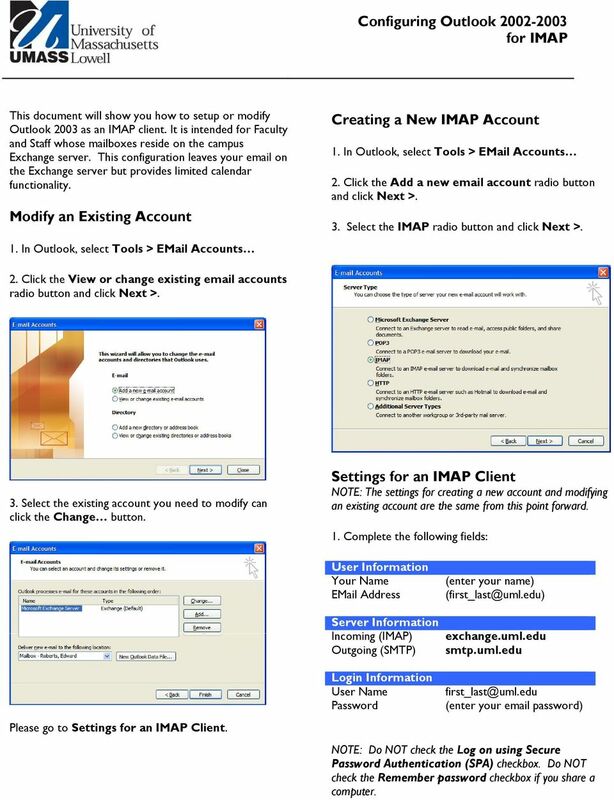 Download "Configuring Outlook 2002-2003 for IMAP. Creating a New IMAP Account. 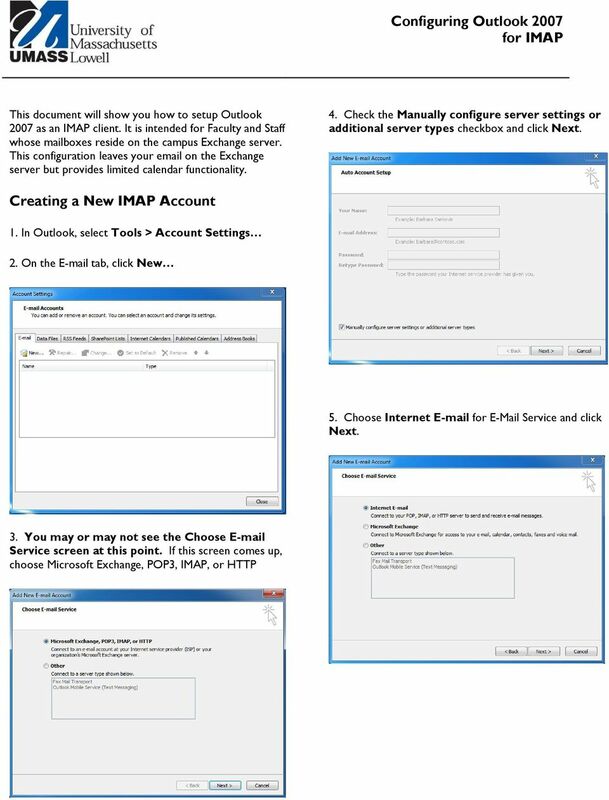 Modify an Existing Account"
3 Configuring Outlook for IMAP This document will show you how to setup or modify Outlook 2003 as an IMAP client. It is intended for Faculty and Staff whose mailboxes reside on the campus Exchange server. This configuration leaves your on the Exchange server but provides limited calendar functionality. Modify an Existing Account 1. 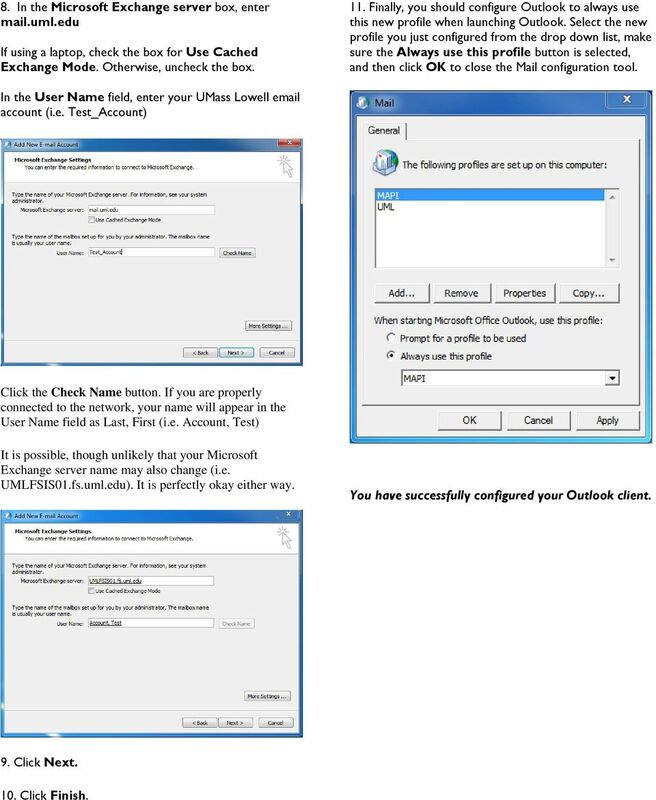 In Outlook, select Tools > Accounts Creating a New IMAP Account 1. In Outlook, select Tools > Accounts 2. Click the Add a new account radio button and click Next >. 3. Select the IMAP radio button and click Next >. 2. Click the View or change existing accounts radio button and click Next >. 3. Select the existing account you need to modify can click the Change button. Settings for an IMAP Client NOTE: The settings for creating a new account and modifying an existing account are the same from this point forward. 1. 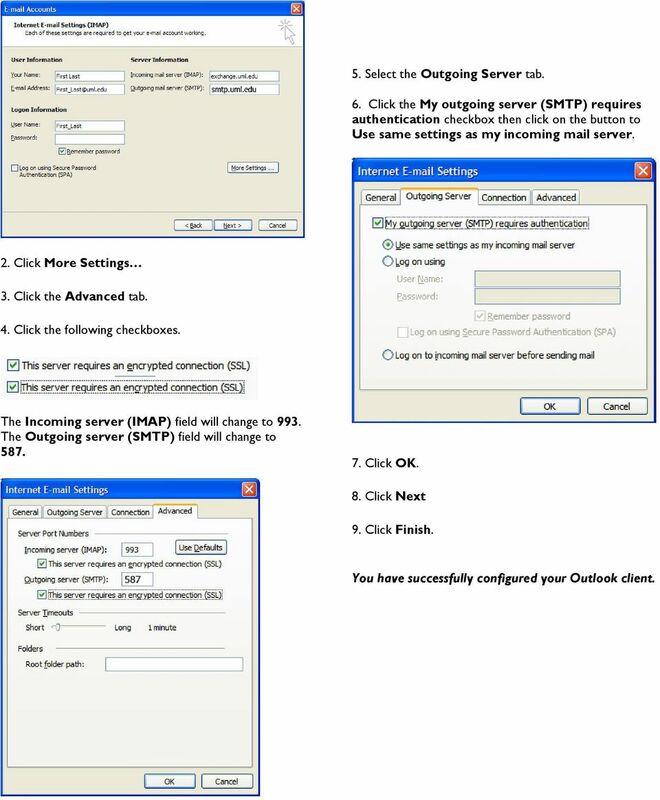 Complete the following fields: User Information Your Name Address Server Information Incoming (IMAP) Outgoing (SMTP) (enter your name) exchange.uml.edu smtp.uml.edu Please go to Settings for an IMAP Client. 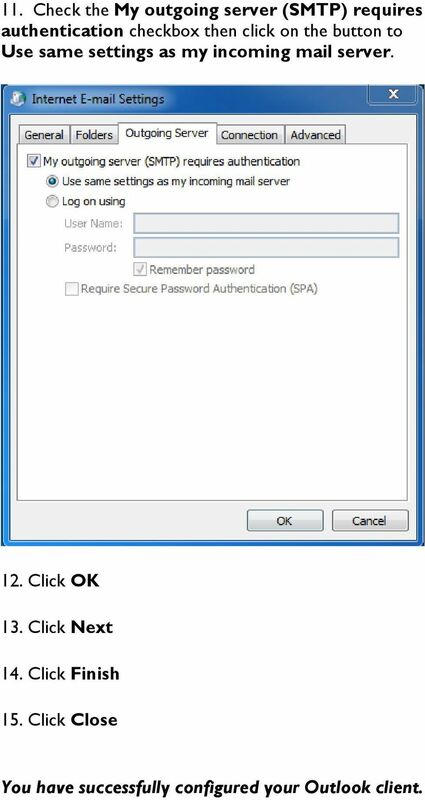 Login Information User Name Password (enter your password) NOTE: Do NOT check the Log on using Secure Password Authentication (SPA) checkbox. Do NOT check the Remember password checkbox if you share a computer. 4 5. Select the Outgoing Server tab. 6. Click the My outgoing server (SMTP) requires authentication checkbox then click on the button to Use same settings as my incoming mail server. 2. Click More Settings 3. Click the Advanced tab. 4. Click the following checkboxes. The Incoming server (IMAP) field will change to 993. 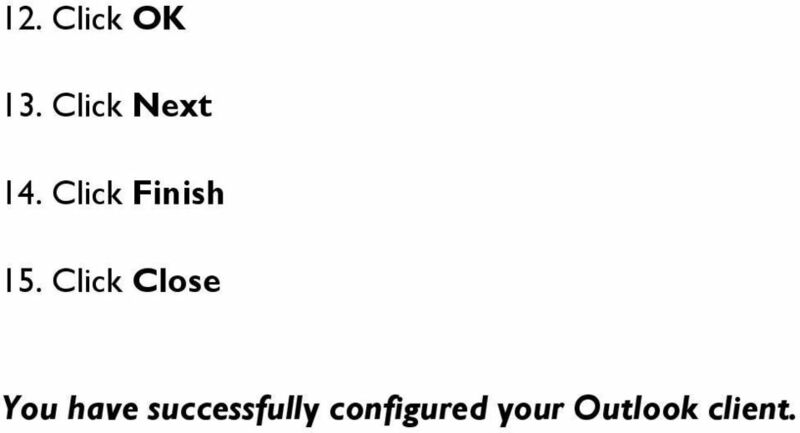 The Outgoing server (SMTP) field will change to Click OK. 8. Click Next 9. Click Finish. You have successfully configured your Outlook client. 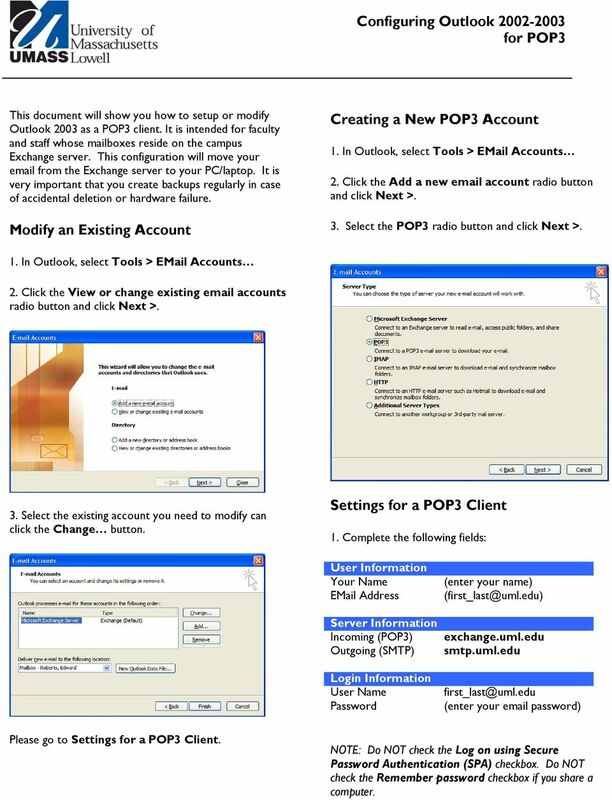 5 Configuring Outlook for POP3 This document will show you how to setup or modify Outlook 2003 as a POP3 client. It is intended for faculty and staff whose mailboxes reside on the campus Exchange server. This configuration will move your from the Exchange server to your PC/laptop. It is very important that you create backups regularly in case of accidental deletion or hardware failure. 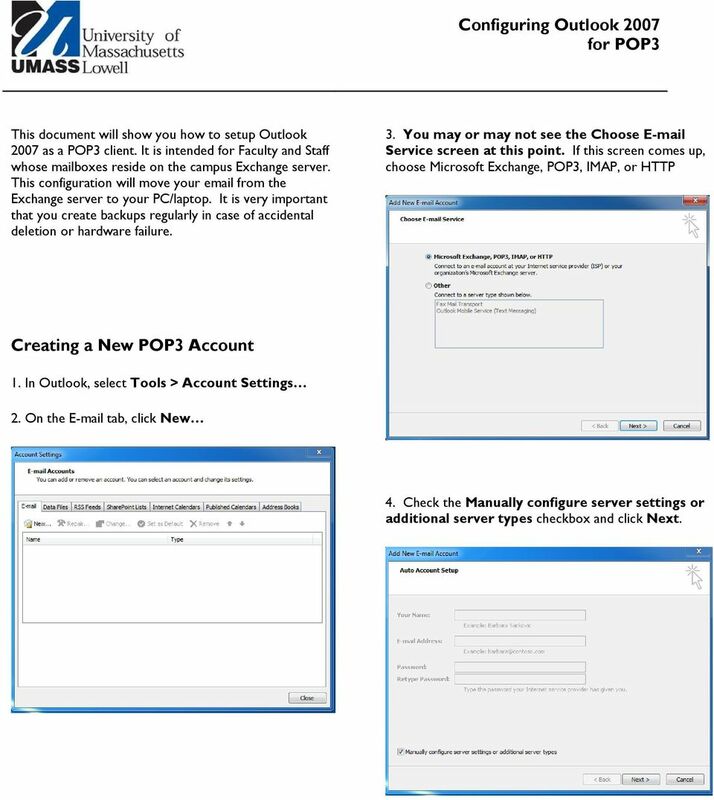 Modify an Existing Account Creating a New POP3 Account 1. In Outlook, select Tools > Accounts 2. Click the Add a new account radio button and click Next >. 3. Select the POP3 radio button and click Next >. 1. In Outlook, select Tools > Accounts 2. Click the View or change existing accounts radio button and click Next >. 3. Select the existing account you need to modify can click the Change button. Settings for a POP3 Client 1. Complete the following fields: User Information Your Name Address Server Information Incoming (POP3) Outgoing (SMTP) Login Information User Name Password (enter your name) exchange.uml.edu smtp.uml.edu (enter your password) Please go to Settings for a POP3 Client. NOTE: Do NOT check the Log on using Secure Password Authentication (SPA) checkbox. Do NOT check the Remember password checkbox if you share a computer. 6 5. Select the Outgoing Server tab. 6. Click the My outgoing server (SMTP) requires authentication checkbox then click on the button to Use same settings as my incoming mail server. 2. Click More Settings 3. Click the Advanced tab. 4. Click the following checkboxes. The port number for the POP3 server will change to 995. The port number for the SMTP server will change to Click OK. 8. Click Next 9. Click Finish. You have successfully configured your Outlook client. 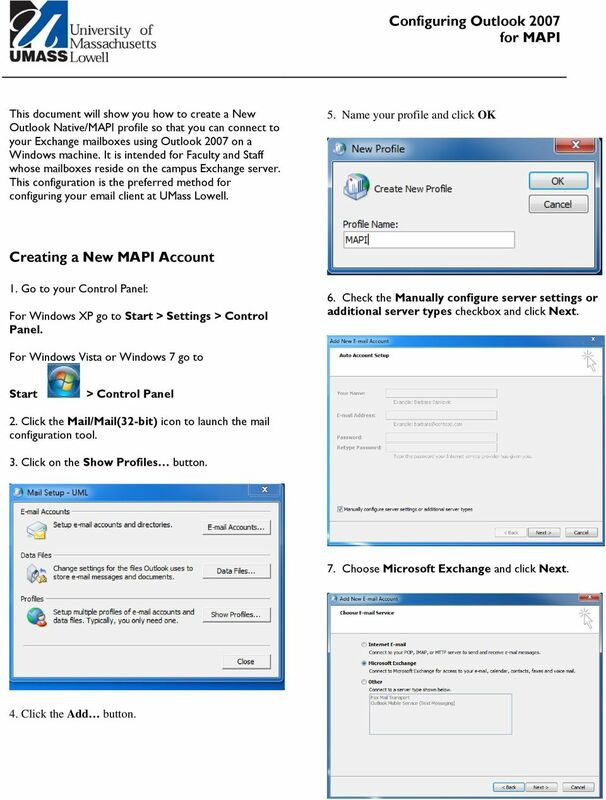 7 Configuring Outlook 2007 for MAPI This document will show you how to create a New Outlook Native/MAPI profile so that you can connect to your Exchange mailboxes using Outlook 2007 on a Windows machine. It is intended for Faculty and Staff whose mailboxes reside on the campus Exchange server. This configuration is the preferred method for configuring your client at UMass Lowell. 5. Name your profile and click OK Creating a New MAPI Account 1. Go to your Control Panel: For Windows XP go to Start > Settings > Control Panel. 6. Check the Manually configure server settings or additional server types checkbox and click Next. For Windows Vista or Windows 7 go to Start > Control Panel 2. Click the Mail/Mail(32-bit) icon to launch the mail configuration tool. 3. Click on the Show Profiles button. 7. Choose Microsoft Exchange and click Next. 4. Click the Add button. 8 8. 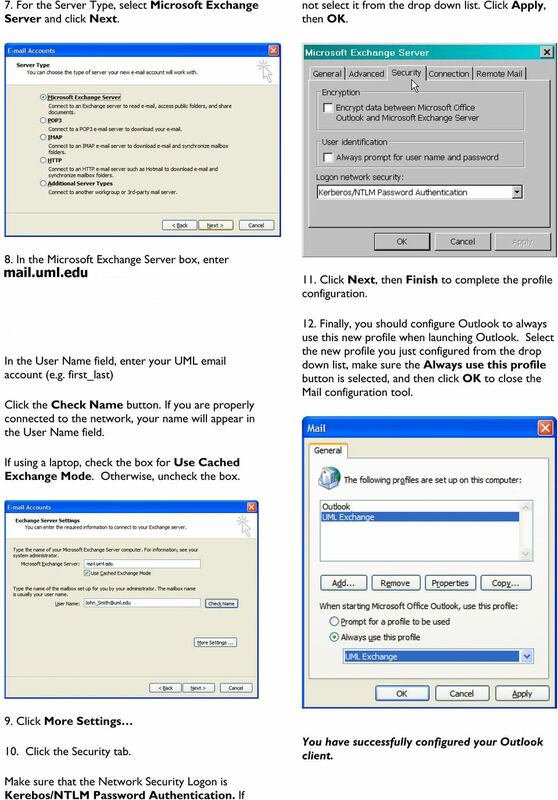 In the Microsoft Exchange server box, enter mail.uml.edu If using a laptop, check the box for Use Cached Exchange Mode. Otherwise, uncheck the box. 11. Finally, you should configure Outlook to always use this new profile when launching Outlook. Select the new profile you just configured from the drop down list, make sure the Always use this profile button is selected, and then click OK to close the Mail configuration tool. In the User Name field, enter your UMass Lowell account (i.e.  Test_Account) Click the Check Name button. If you are properly connected to the network, your name will appear in the User Name field as Last, First (i.e. Account, Test) It is possible, though unlikely that your Microsoft Exchange server name may also change (i.e. UMLFSIS01.fs.uml.edu). It is perfectly okay either way. You have successfully configured your Outlook client. 9. Click Next. 10. Click Finish. 10 6. Settings for an IMAP Client Complete the following fields: User Information Your Name (enter your name) Address 9. For Incoming Server (IMAP), use SSL as the type of encrypted connection. The port 143 will automatically change to 993. For Outgoing server (SMTP), use TLS as the type of encrypted connection. Change port 25 to port 587. Server Information Account Type Incoming mail server Outgoing mail server Logon Information User Name Password IMAP exchange.uml.edu smtp.uml.edu (enter your pswd) NOTE: Do NOT check the Require logon using Secure Password Authentication (SPA) checkbox. Do NOT check the Remember password checkbox if you share a computer. 10. Select the Outgoing Server tab. 11. Check the My outgoing server (SMTP) requires authentication checkbox then click on the button to Use same settings as my incoming mail server. 7. Click More Settings 8. Click the Advanced tab. 11 12. Click OK 13. Click Next 14. Click Finish 15. Click Close You have successfully configured your Outlook client. 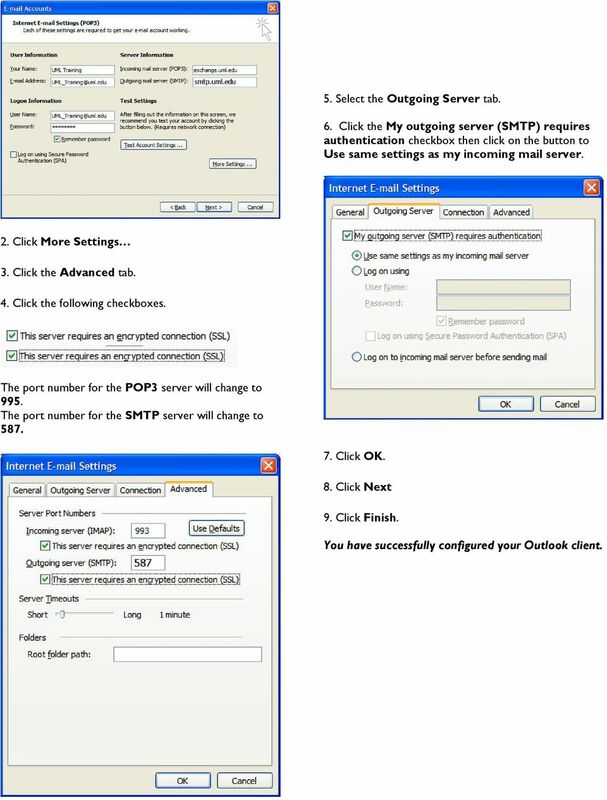 12 Configuring Outlook 2007 for POP3 This document will show you how to setup Outlook 2007 as a POP3 client. It is intended for Faculty and Staff whose mailboxes reside on the campus Exchange server. This configuration will move your from the Exchange server to your PC/laptop. It is very important that you create backups regularly in case of accidental deletion or hardware failure. 3. You may or may not see the Choose Service screen at this point. If this screen comes up, choose Microsoft Exchange, POP3, IMAP, or HTTP Creating a New POP3 Account 1. In Outlook, select Tools > Account Settings 2. On the tab, click New 4. Check the Manually configure server settings or additional server types checkbox and click Next. 13 5. Choose Internet for Service and click Next. 7. Click More Settings 8. Click the Advanced tab. 6. Settings for a POP3 Client Complete the following fields: 9. For Incoming Server (POP3), check This server requires an encrypted connection (SSL) check box. The port 110 will automatically change to 995. For Outgoing server (SMTP), use TLS as the type of encrypted connection. Change port 25 to port 587. User Information Your Name Address Server Information Account Type Incoming mail server Outgoing mail server Logon Information User Name Password (enter your name) POP3 exchange.uml.edu smtp.uml.edu (enter your pswd) NOTE: Do NOT check the Require logon using Secure Password Authentication (SPA) checkbox. Do NOT check the Remember password checkbox if you share a computer. 10. Select the Outgoing Server tab. 14 11. Check the My outgoing server (SMTP) requires authentication checkbox then click on the button to Use same settings as my incoming mail server. 12. Click OK 13. Click Next 14. Click Finish 15. Click Close You have successfully configured your Outlook client. Note that if at any time during the setup process you are asked to login, click either Cancel or Work Offline depending upon the prompt.